Today, getting work done on a computer is more within reach of those with disabilities, with the help of new and updated tools. In fact, a new generation of gadgets, gizmos, and software is making it even easier for disabled computer users to provide home computer service to businesses around the world. With today’s technology, disabilities are no longer a roadblock to travel the digital world, interact with others, and get work done. A computer doesn't care that the user is controlling the pointer with their feet or eye movements instead of a traditional mouse and keyboard. For example, a blind executive can speak into a microphone to work on their system. For output, a screen-reading software can read the data aloud back to them. Similarly, a paralyzed writer can ‘type’ by using the subtle movement of their eyes and neck muscles to control the computer. Even the great Stephen Hawking uses a specially designed system that ‘reads’ movements in his cheek to operate. With this system, Mr. Hawking writes lectures and speeches, checks his email, surfs the web, and even spends time on camera with others! What a ‘cheeky’ way to operate a computer! People with disabilities have to deal with a myriad of challenges to provide effective home computer service. They can have difficulty either giving the computer input, or interpret the computer’s output, or both. Depending on their disability, there are several different devices that can help. With the assistance of these devices or software, someone with a disability can more easily access their computer. These devices are collectively known as Adaptive or Assistive Computer Technology. For those suffering from low or impaired vision, the challenge comes in interpreting visual output from a computer monitor. Some assistive systems come in the form of unique hardware such as portable CCTVs, refreshable Braille displays, and large-print keyboards. Software features such as text-to-speech allow users to hear what's on the screen instead of reading it. Other features, like high-contrast themes and enlarged cursors, make it easier for users with limited vision to see the screen. Those who are not blind, but have poor vision can benefit from computer apps that magnify what is on the screen. For those who have difficulty hearing, there are also several assisted technology devices that can help them provide effective home computer service. For example, closed-captioning helps to convey audio information to deaf users in visual form. Those with hearing impairments can also use mono audio systems. These systems transmit both right and left audio signals through both earbuds and headphones. This way, those users with limited hearing in one ear can hear all of what they are listening to. For those with physical disabilities, typing with a keyboard or moving a mouse may be especially difficult, if not impossible. Paralysis, lost limbs, or diseases like muscular dystrophy can severely limit one’s use of their hands and arms. Fortunately, there are several alternatives to a physical mouse and keyboard. Many technologies focus on providing better input devices. This way, even those who have physical impairments can help provide home computer service. For example, a trackball or joystick may be more efficient than a mouse for those with limited use of their hands. They can also use the mouse to control an on-screen keyboard for typing. For those with more severe impairments, there are devices to control a mouse with head motions, eye movements, or even muscle twitches. More efficient one-handed keyboards are also an option for those who have the use of only one hand. Those who suffer from learning, cognitive, or memory disabilities usually benefit greatly with the assistance of one or more of the above mentioned assisted-technology devices. Some may benefit from more on-screen interactive tools, such as those used by people with physical disabilities. Large keyboards used by those with vision impairments may also help those with cognitive disabilities. Still, others may find the audio tools used by people with impaired hearing provide help to someone with a visual learning disability. In today’s world, using a computer isn’t just for the able-bodied, but for everyone. With advancements in computer technology, even the disabled take better advantage of the mainstream world of computing. Personal computers have become the backbone of independence for millions of individuals with sensory, physical, and learning disabilities. 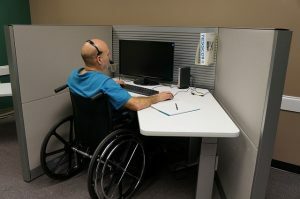 The gap between what people with disabilities can and cannot do is slowly disappearing, and more people with disabilities are making a living providing an array of services, including home computer service. But of course, computers are not infallible. If a computer doesn’t run as well as it should, any person may have difficulty providing home computer service. However, for those in the Los Angeles area, home computer repair is just a phone call away. The helpful computer repair gurus at Tech Studio Mac and PC Repair are L.A.'s #1 mobile computer repair service. They can help with more than fast and friendly computer repair. They can also help someone with disabilities set up a solution for their unique challenges. This way, they too can join the workforce by providing business computer services to companies around the world.